Swissotel Nankai OSAKA offers 546 spacious guest rooms including Deluxe Executive Floors, 6 restaurants and bars featuring International cuisines from around the world. Staying guests can also access the full fitness facilities equipped with a fitness gym, indoor swimming pool and sauna. 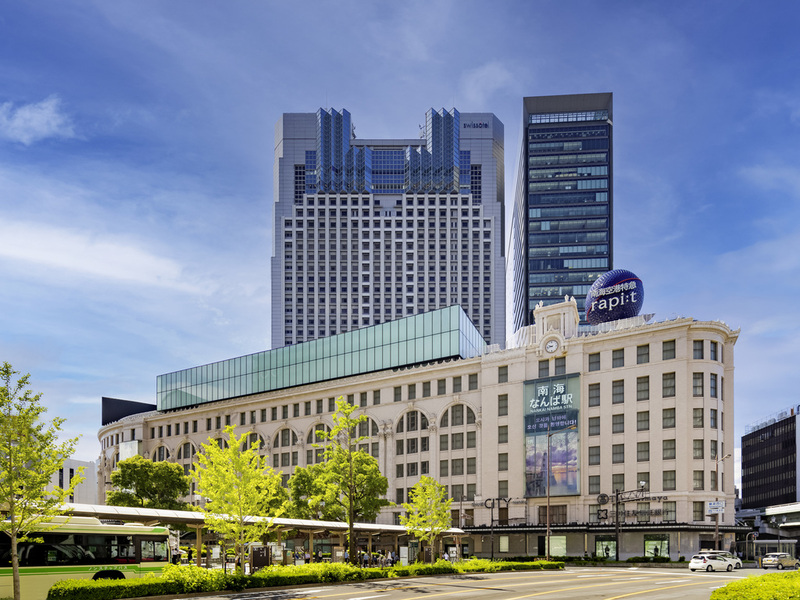 The only Osaka hotel to provide a direct train to Kansai International Airport - with a comfortable 35-minute ride on board the Rapid Express Train to Nankai Namba Station situated just under the hotel itself. Please note that Pürovel Spa & Sport is closed between 07.05.2019 and 13.05.2019 for annual maintenance. During this period, the entire facilities within is not accessible (In-room massage is available). We apologize for any inconveniences caused. Our 546 contemporary designed guest rooms offer luxury accommodation to leisure and business travellers. Check into modern comforts in our Swiss Advantage and Swiss Executive Rooms. Swiss Gourmet offers freshly brewed coffee and daily baked homemade breads, cakes, sweets and savouries as well as a selection of Swiss chocolate. All these original hotel items are available for grab and go. "Kushiage" - Osaka's traditional deep fried skewer is SH'UN's specialty, which can be enjoyed from a selection of seasonal course menus or from the a la carte menu. Hana-Goyomi offers traditional Japanese cuisine, such as a Kaiseki style dining experience, combining an appreciation for the changing seasons with unparalleled culinary craftsmanship. Tavola36 is located on the top floor of the hotel and offers stunning views of Osaka's cityscape during day and night. Our skilled Teppanyaki chefs prepare only the finest Japanese beef and freshest seafood in front of your eyes. Watch them work their magic while enjoying some wine of our collection from leading wineries from around the world. This elegant restaurant serves a selection of savoury Cantonese favorites as well as our famous "Dim Sum Order Lunch Buffet". The Lounge offers a comfortable and contemporary environment in which you can enjoy light meals, our unique afternoon tea sets, homemade cakes and desserts and a selection of international coffee and tea specialties, champagne, cocktails and more. Merkezi konumda ulaşım olanaklari iyi standart bir şehir oteli ancak sarf malzemeleri kaliteli degildi .otel temiz degildi halilar ve duvarlar lekeliydi. Dear Ms. E., Warmest Greetings from Swissôtel Nankai Osaka. We greatly appreciate your support and highly value your patronage. Thank you very much for choosing to stay at our hotel and for participating our online questionnaire. The survey ratings regarding your overall staying experience have been reviewed carefully. We would like to first apologize for the discomfort caused by the cleanliness level of the room you have stayed. Please rest assured that our room attendants have been given stern reminders of our existing policies and we will conduct retraining on proper procedures to ensure that we meet the cleanliness standards expected from a hotel of our caliber. Also, please be advised that we are consistently operating renovation of guest rooms and continuously working on ways to improve the condition of our products. In fact, we are currently renovating our Classic rooms and we are confident that their new designs, atmospheres, furniture’s and equipments will be to your liking. Further, we appreciate your valuable highlights regarding our amenities and we will continuously make our efforts in various areas to ensure total guest's satisfaction. As for the internet connection, it is unfortunate that you felt uneasy to access the WiFi. We would be glad to address your concern if you could give us any more information about the challenge you had so that we can follow-up on this. In the meantime, our System Manager has already spoken to the Service Provider to check the possibility of changing the login screen so that our guests are able to have easier access to the internet. We sincerely hope that this did not spoil your stay too much. Ms. E., it is our endeavor at all times to deliver the highest level of satisfaction and perfection to our guests so we greatly value your feedback. We would be glad to welcome you back to Swissôtel whenever you have the chance to visit Osaka again to demonstrate that your comments were not made in vain. If we can be of any assistance for your future bookings, please do not hesitate to contact us any time. Kind Regards, Christian Schaufelbühl, Representative Director & General Manager Swissôtel Nankai Osaka 5-1-60 Namba Chuo-ku | Osaka 542-0076 | Japan Phone: +8… (Ext:3000) | Fax: +8… www.swissotel.com/osaka This message is confidential and intended only for named recipient. If the reader of this message is not the intended recipient, you are notified that any distribution or copy of this message is strictly prohibited.